A beautiful photo, an unusual metal art piece, or framed artwork add to your home's overall look and feel. Blank walls leave us feeling empty and unfinished. The process of hanging artwork baffles many home decorators, but we have a few tips to help make the process a little easier. The following guidelines will help you answer some of the most common questions. How do I choose between art and a mirror? How can I hang a large piece of art or mirror securely? How high should a picture be hung on the wall? In general, artwork should be hung so that the center point of the picture or grouping is at about eye level for the average person. While this won't be possible in every situation, it's a good guideline to keep in mind. Approximately 60 to 65 inches from the floor to the center of the art is a place to start. When hanging a large picture over a table or sofa for instance, the bottom of the frame should sit within 6-12" of the tabletop. 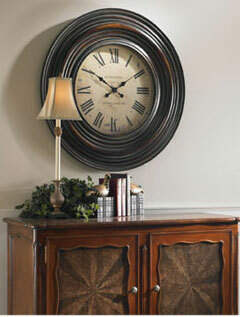 The designer's rule of thumb is to make sure that the artwork is about 2/3 to 3/4 the length of the furniture. How do I group my art? Remember that a grouping of pictures should be thought of as one unit. Test an arrangement of pictures by laying everything out on a large table (or on the floor), playing with combinations until you hit upon one that works. Laying them out on paper is even better since you'll be able to trace around each object and determine where picture hangers should be installed. Tape or pin them to the wall with straight pins, move them around until you find an arrangement that works. One large painting makes a statement and keeps things simple. It can also call attention to the focal point of the room which is often the fireplace. 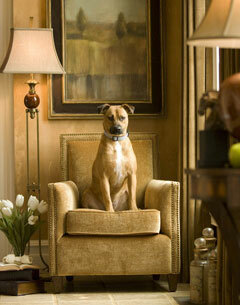 Avoid hanging matching pictures in a perfect line whenever you'd like to emphasize a casual atmosphere. A small picture hung on a large wall can look out of balance. Look for narrow walls (such as the spaces between two doorways or windows) and consider hanging two or three small pictures in a vertical line. In this case, treat the center picture as the center of the grouping. Regardless of method, the key is balance and proportion. How and where should wall art be arranged? Well, ask yourself where you would like the "eyes" to focus. Finally, when grouping pictures, take note not to position the pictures too close to each other. If the pictures are placed too close, they lose their individuality, and if they're placed too far apart, they will lack unity. Art can be humorous, fun, and whimsical. Look for themes that fit your decorating style and bring out the colors in other elements of the room -- in fabrics, wall color, flooring, and window treatments. Popular art shelves are a great way to add interest and take up very little space. Artwork can be hung on the wall over the shelf as well as set onto the shelf with other decorative objects. The posibilites are endless. Happy decorating.